Converts an SFP port to an LC fiber connection. Just run an LC-LC fiber optic patch cable from the device to the switch. Transmits at 850nm for distances up to 500 meters on 50 micron MMF, and up to 300 meters on 62.5 micron MMF. Finisar Corporation is a technology leader for fiber optic subsystems and network performance test systems. These products enable high-speed data communications for networking and storage applications over Gigabit Ethernet local area networks (LANs), Fiber Channel storage area networks (SANs), and metropolitan area networks (MANs) using both IP and SONET/SDH-based protocols. 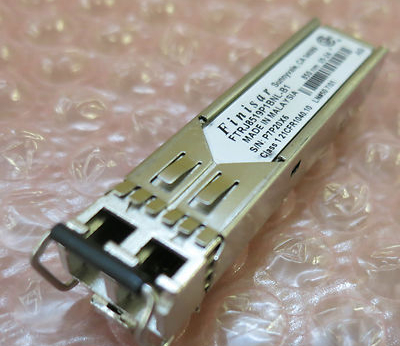 The Finisar FTRJ8519P1BNL is a 1000BaseSX + Dual Rate 1G/2G Fiber Channel SFP mini-GBIC transmitting at 850nm. Transmitts up to 500m on 50/125micron MMF and up to 300m on 62.5/125micron MMF.